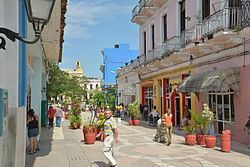 Sancti Spíritus is a municipality and capital city of the province of Sancti Spíritus in central Cuba. 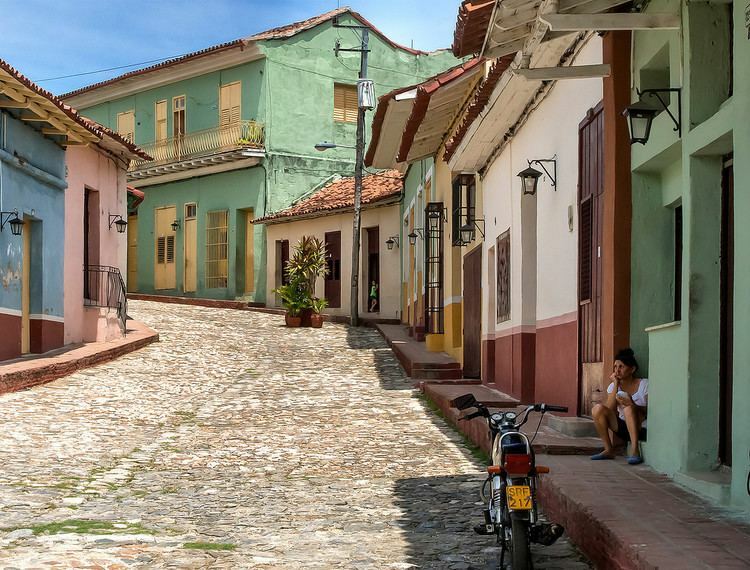 Sancti Spíritus, Latin for "Holy Spirit", is one of the oldest Cuban European settlements. The city was founded by Diego Velázquez de Cuéllar in 1514. The city contributed men for Hernan Cortes' 1518 expedition to Mexico, including Alonso Hernandez Puertocarrero, Gonzalo de Sandoval, and Juan Velazquez de Leon. Francisco Iznaga, a Basque landowner in the western portion of Cuba during the first thirty years of the colonization of Cuba, was elected mayor of Bayamo in 1540. Iznaga was the originator of a powerful lineage which finally settled in Sancti Spíritus and Trinidad, where Torre Iznaga (Iznaga Tower) is. His descendants fought for the independence of Cuba and for annexation to the U.S., from 1820 to 1900. The municipality is divided into the barrios of Banao, Bellamota, Bijabo, Guasimal, Hospital, Jíbaro, Manacas, Mapos, Paredes, Paula, Pelayo, Pueblo Nuevo, San Andrés, Tuinicú, Tunas de Zaza and Zaza del Medio. The Zaza Reservoir is located southwest of the city. The city has a central park which is a place of great entertainment for the persons of all ages. According to the Köppen Climate Classification system, Sancti Spíritus has a tropical savanna climate, abbreviated "Aw" on climate maps. In 2004, the municipality of Sancti Spíritus had a population of 133,843. With a total area of 1,151 km2 (444 sq mi), this means a population density of 116.3/km2 (301/sq mi). 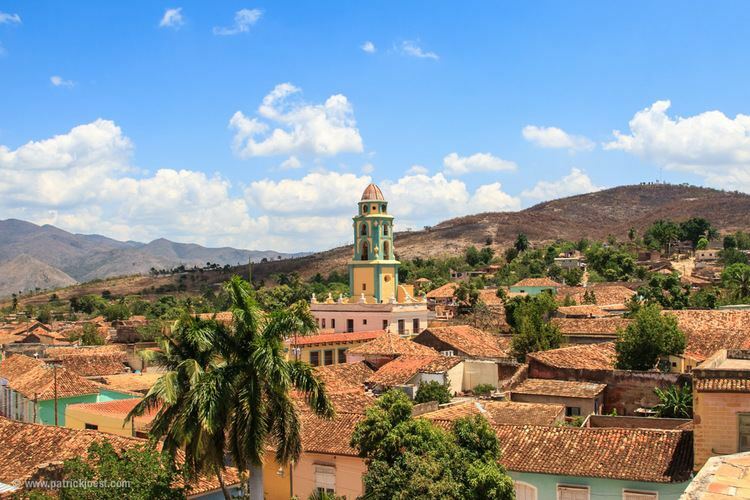 The Parroquial Mayor is located two blocks south of the town's main square; it is a venerable green-towered church whose early 16th-century origins make it the country's oldest. 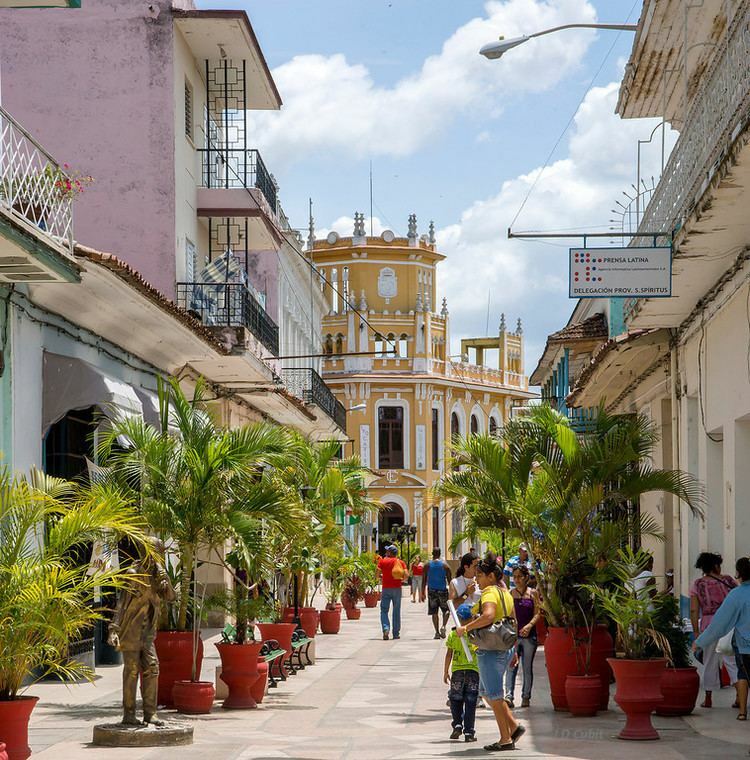 Nearby is the Museo de Arte Colonial (Colonial Art Museum), one of Sancti Spíritus's most attractive colonial homes and a standout attraction. 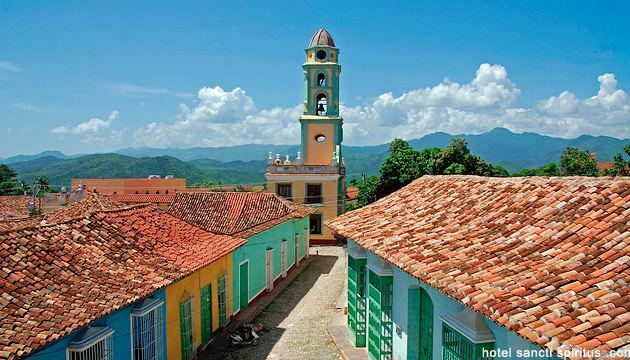 The opulent former palatial mansion of the Valle Iznaga clan, one of Cuba's most elite families who fled Cuba after Fidel's Revolution, it became the property of the state in 1961. Ninety percent of what you see inside, from furniture to paintings, is original. Though the family obviously kept an impressive collection of Limoges porcelain, French gilded mirrors, Italian marble tables, and Baccarat crystal chandeliers here, it wasn't their primary residence; the house was used mostly to host family members in transit, so the furnishings were rather eclectic. The three bedrooms are decorated in grand style, though, with handmade lace, embroidered sheets, and hand-painted glass. There is a gorgeous and very Cuban leather sillón fumador (smoking chair) and, in the music room, the mid-18th-century American piano, one of only two of its type in Cuba. In the tearoom is the family seal, which says: "El que más vale no vale tanto como Valle vale" ("He who has the greatest worth isn't worth as much as a Valle is worth"—playing off the Spanish word for "worth" with the family surname). 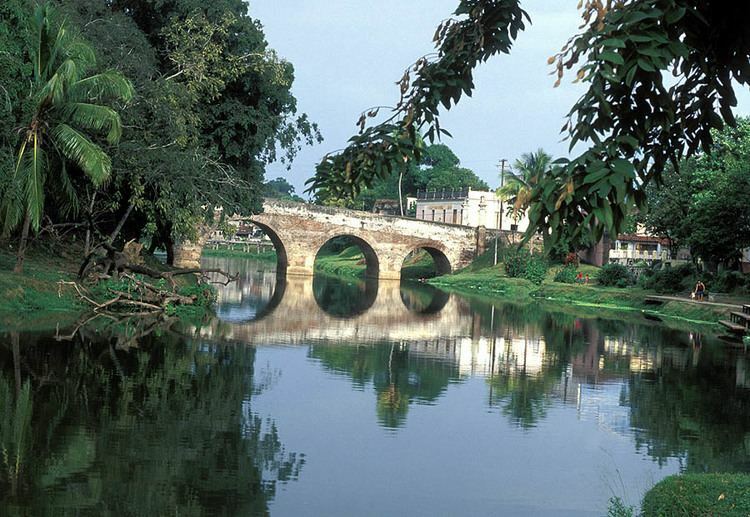 Another interesting landmark is one of Cuba's older bridges over the Yayabo river. Built in 1815 with clay bricks it forms five arcs, the center being 9 meters tall. The entire bridge is only 85 meters long and was designed for pedestrians and carriages during colonial-era Cuba but has thus far resisted heavier modern traffic. 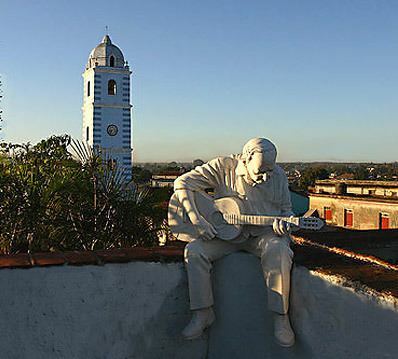 Sancti Spíritus has a famous Medical University located at the Main road in Olivos III. It has students from all over the world representing 34 nationalities. The university is affiliated with ELAM in Havana. 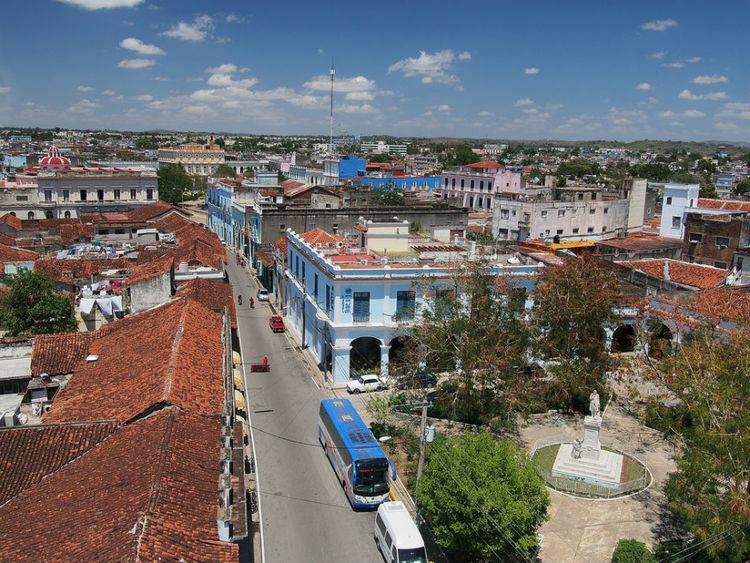 The city is crossed in the middle by the Carretera Central (CC), the Cuban principal highway spanning the length of the island. It is also served by the Sancti Spíritus Airport and by the A1 motorway, at the exit "Sancti Spíritus-Yaguajay", located near Guayos. It counts a railway station on Cabaiguán-Sancti Spíritus-Tunas de Zaza line, with express trains from/to Havana, a terminal for interprovincial omnibuses and an urban bus service. The local baseball team is the Sancti Spíritus Gallos, and its hoem ground is José Antonio Huelga Stadium. The local football team is the FC Sancti Spíritus.